I love these chewy pumpkin cookies. They are pretty much like little breads. 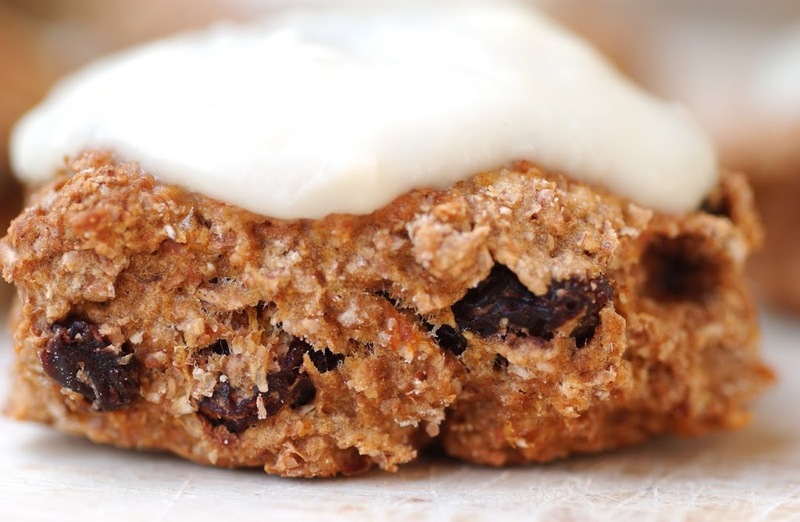 The raisins inside and the icing on top make it a truly sweet treat, yet still a healthy one. They are best eaten warm, or at least the same day. Leftovers (though we never have any) can be heated in the microwave and are almost as good as the fresh ones. They are lovely with a cup of tea or coffee, and can surely be eaten as a wholesome breakfast or snack in the afternoon. Cut the pumpkin into cubes and steam until tender. Then mash very finely with a fork or a food processor. Preheat oven to 220 degrees Celsius. Line a baking sheet with parchment paper. In a bowl, combine flour, baking powder, baking soda, salt spices and raisins. Mix well. Gently fold in the pumpkin. The dough should be crumbly now. Add the milk and stir until the dough becomes soft. Flatten the dough onto a well-floured surface. Use your flat hands to press the dough down to 2-3cm thickness. If you use a rolling pin, you should sprinkle some flour on top of the dough before. Use a big biscuit cutter or small glass (approx. diameter 5cm) and press through the dough right down to the bottom. Place the cut pieces on the baking sheet. Bake for 10 minutes. Let cool on a cooling rack. Combine cream cheese with agave syrup. Put a layer of the icing mixture on top of each biscuit and let become solid. Best eaten the same day.